This blog article is edited from the developer's blog, where he talks about his work creating physical and installation-based games. 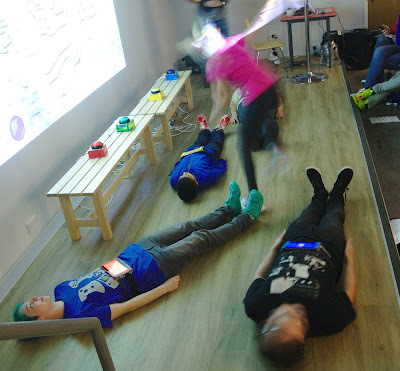 As a game developer I've developed a genuine passion for physical play. I love the idea that the game is not the be-all and end-all of the experience, but merely the springboard for players to make joy for themselves. It's a passion that's led me to dress people up in morphsuits and send groups of friends crashing around the walls of a museum. What I love about physical play is that it encourages people to come out of their shells, to express themselves, and to perform for each other. So I've been fascinated by bringing that kind of play into a theatre space. I want to know how play changes what players have a bona-fide audience, and how a crowd of a hundred people can bring their own unique personality to games. To find out, I created a show. An Incredible Playable Show. The Incredible Playable Show was performed as a run of six shows during Nottingham's GameCity festival, where it won the Spirit of the Festival award. 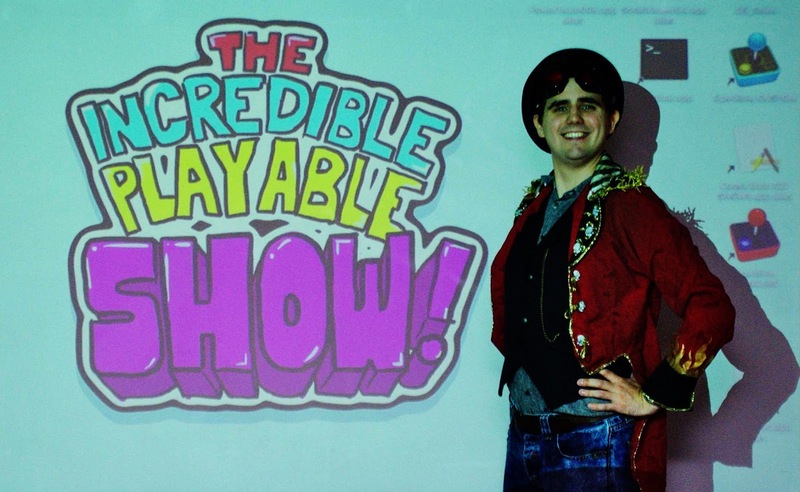 It has since run at the Bristol Improv Theatre, and has been invited back to the National Videogame Arcade as their Christmas show, and - due to its popularity - will no doubt be at a number of new venues in 2017! 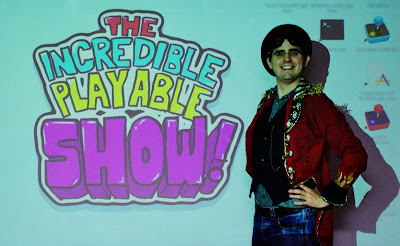 What is The Incredible Playable Show? 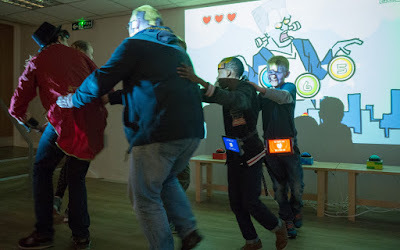 The show is takes three games of my own invention, involving physical interaction, running around and unconventional homemade controllers. It seats alongside classic games reinterpreted with custom hardware, and sees spectators invited onto the stage to become players. There's barcode scanners, WiFi-connected power belts, microphones and secret dossiers. Players must interact with each other and with the audience to play the games - each one is a socially interactive experience. Sometimes players take the role of human controllers. Other times they must climb through the audience, who have become real-world obstacles in a digital game. In the final act the audience must work together to solve coded messages, getting out of their chairs to pass clues to each other and share ideas. 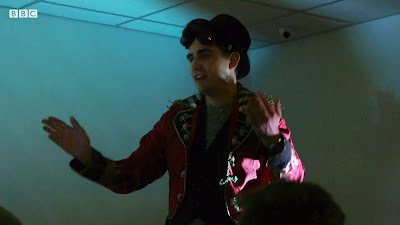 As well as creating the games and operating the tech, I donned a ringmaster's jacket and drew upon my improv skills to host the event. 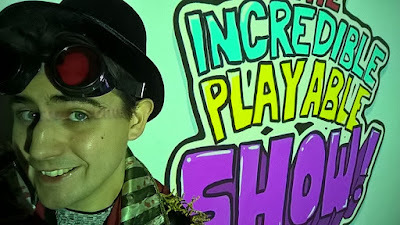 Turning games into a show is not just about the tech itself - having a showman to warm the audience and encourage them to perform themselves is half of the magic. 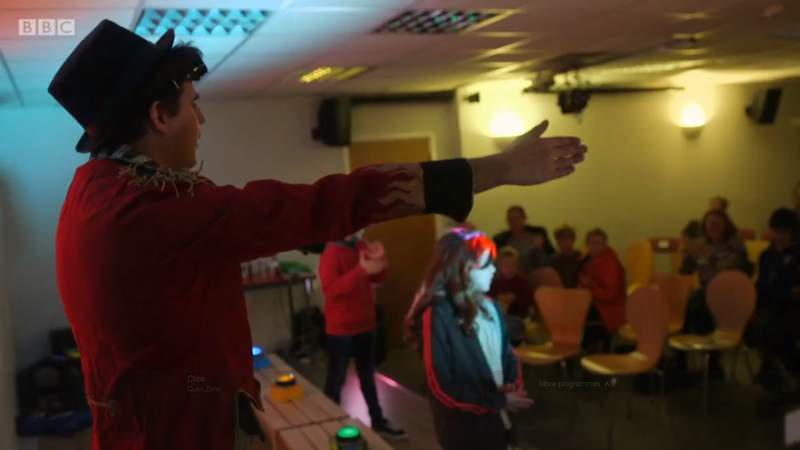 As the show's designer my ethos is that everyone in the audience should get to feel involved in a real way. Even if you weren't on the stage playing you should feel like you made a meaningful contribution to how the events played out. Additionally I stuck to a design goal of keeping every game relatively low-tech. It’s not about flashy hardware, but rather what can be done by combining simple technology with a theatre space. The charm is seeing games that look like nothing you've ever seen before, after all. So it's important that every spectator understands exactly what is going on in each game, so that they can be surprised and inspired. No networking issues, no lag, and no anonymous voting - game feel is as important here as in any other context. Similarly, each game was designed to feel significantly different in terms of how players and audience interacted with the stage, with the technology and with each other. I was there to explore, to learn and to inspire, so the more the dynamics varied the more I was able to learn. The best way to describle what the show was like is perhaps to explain what the games themselves were. 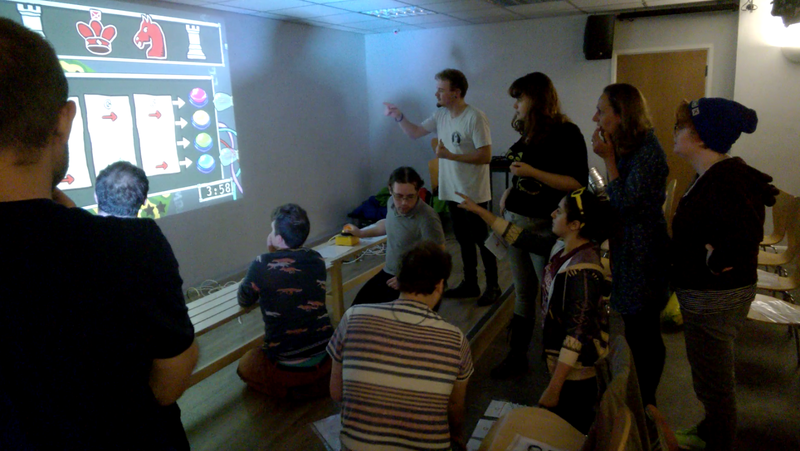 Each game was roughly 8 minutes long, with a period of setup and improvised chatter in-between. Four players are invited up from the audience to wear coloured power belts. By donning the power belts they become the four Rangers, and effectively take on the role of human buttons. One player is invited from the audience to become Hero of the Galaxy. On the screen, giant monsters are shown attacking a city. To defeat the monsters, the saviour must press the power belts in the order shown on-screen. However, every time a new monster appears the four rangers are given a new command by the computer. For example, they may be told to "lie on the floor," to "join hands and spin" or to "hi-five everyone in the audience." The challenge for the player is to deal with a physical environment that changes as the rangers move around of their own accord. Each time a player fails, another hero is pulled out from the audience to help them, until the team runs out of lives. This game grew out of an experiment I did at JOIN in Berlin last year, and uses the same belts. They're actually just Tesco Hudl tablets with belts taped on, and connect via WiFi to the game running on the computer. I’d been inspired by how the audience in Berlin found ways to interact with the performers. Rangers get to express themselves creatively in how they interpret the commands the computer gives them, often to make the audience laugh. When the computer prompts Rangers to enter the audience the audience gets to interact with the Rangers too. They also get to help the heroes out by shouting out the colours. The audience’s interaction with the game is loose and flexible, which makes sense in this game. The magic of Go! Power Team! comes from how the participants interpret the real-world rules. One member of the audience is selected as the Floor Manager, and given a barcode scanner. Ten members of the audience are selected to be Consumer Products. They remain in their seats and are each given a netball vest with a barcode on it. 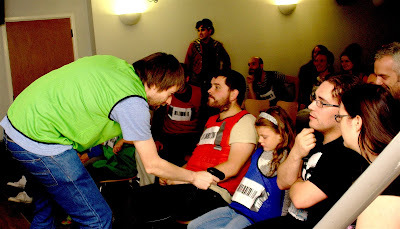 During the game, the Floor Manager must to clamber between the members of the audience, scanning their barcodes to make cards appear on-screen. Their goal is to find three pairs of matching cards each round. Every round all the Consumer Products are allocated new cards, with each set of cards becoming harder to tell apart. 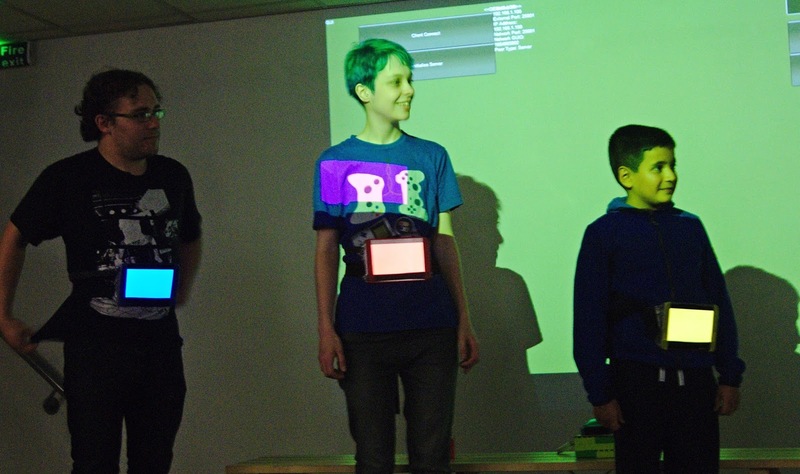 Match Me If You Scan was an opportunity to explore the audience as a physical presence. The idea is that the audience, whether they are consumer products or not, form the obstacle course that the Floor Manager has to negotiate. When designing the show I was keen to vary the soft skills each game drew upon. So while the Floor Manager’s role in the game is very physical, the Consumer Products interact through memorisation and visual reasoning. As the game goes on they’ll need to pay close attention to spot and remember what makes their card different from the others in the set. Playing the game gets a lot of strangers to cooperate with each other, which I love. When an audience member spots a match they would shout out a description of the two people who need to be scanned. This human element highlights that the game world is made of people, and not of purely digital components. Three members of the audience are invited up onto the stage, and each take a button. 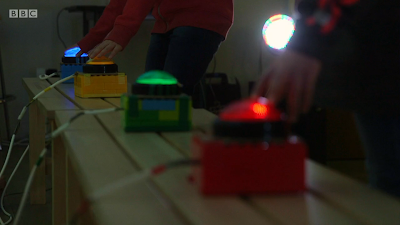 Each button corresponds to either Left, Right or Down on the controller. Every ten seconds the buttons change their roles, so the team needs to pay attention and communicate. 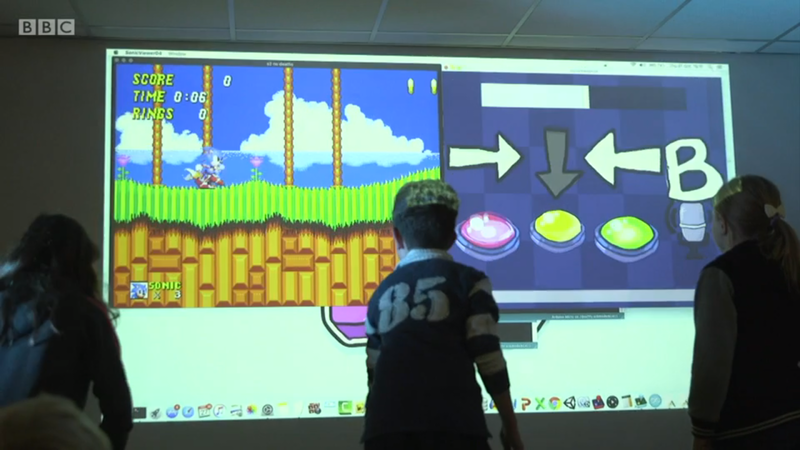 Meanwhile, the audience control’s Sonic’s jump by shouting “Jump!”, which is picked up by a microphone and processed as a press of the A button on the controller. Once the team is past the first level, the role of the microphone input is randomised alongside the rest of the buttons. Sonic the Hedgehog 2 works really well for experimental input devices given its forgiving levels, and its easy-to-interpret physics-based gameplay. Controlling Sonic, which should be easy, becomes difficult when the task is spread among a team, making a great source of comedy. One of the funniest moments came up when the team had been struggling for ages to get up a simple slope. When they finally managed everyone in the audience clapped and cheered. The microphone was, at that point, mapped to the left button, sending Sonic right back down the very same slope he’d just reached the top of. The finale of the show is adapted from a game I often run as an installation. For the show I used a special build, which put the focus predominantly on puzzles involving real-world props. These props were distributed among the seats before the show started. To see what would happen, I decided not to tell the audience how to play the game before it began. I liked the idea of passing the mantle onto the audience at the end of the show, so that the finale belongs to them, not to me. It was very effective in generating communal spirit. Four coloured buttons are set up on stage. A button sequence appears on the screen which must be input by volunteers from the audience. As the game progresses the on-screen buttons are replaced by symbols, and audience must decipher which symbol matches which button. 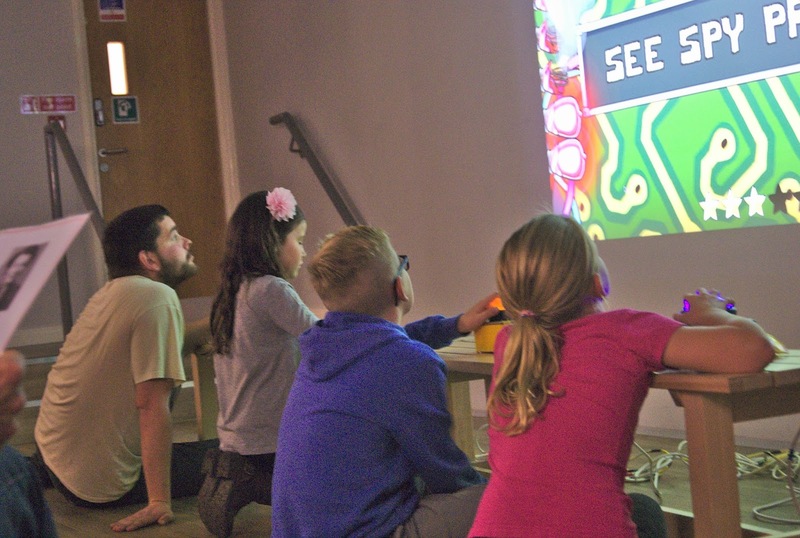 The clues get more complex as the game goes on, and start to involve physical props hidden around the play-space - including punchcards, circuit diagrams and photographs. The magic of the game is in the amount of communication the audience have to make with each other. To succeed, everyone needs to communicate what props are near them, or what they think the team needs. The result was the majority of the audience standing up, out of their seats, passing documents around. They were talking, clambering between the seats, and really making the space their own. It really demonstrated what I'd set out to uncover - a fresh take on interpersonal interation made possible by a theatre venue. 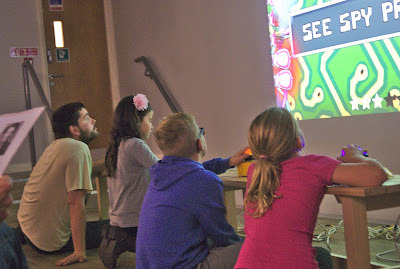 I’d asked to run six shows during the GameCity festival for a reason. It was so that I had a chance to learn from each performance. Doing local-multiplayer installations has taught me that you never really understand your game until you see it in its live environment. As a designer you make assumptions about the venue and how players will connect to what you're presenting them. You'll be amazed how many design flaws will seem obvious in the cold light of day, so it's important to accept your own lack of knowledge and be ready to adapt and change. The biggest issue I faced in the first few shows was the running order, which placed Go! Power Team! as the first act. It's the most physically active and expressive game. At that the beginning of the show the audience are, quite reasonably, shy, quiet and tentative. They don’t know what to expect, and haven't warmed up to the idea of being silly on a stage. For performances 3 to 6 I made Go! Power Team! the third act. Instead, I opened the show with The Mega Cooperator - a far stronger warm-up act. The three volunteers on-stage don’t have to do anything that drew too much attention to them. The audience get to scream and shout and express themselves from the comfort of their chairs. Meanwhile, those audience members who would enjoy being silly and being the centre of attention have their appetites whetted. They get pumped for the more expressive games to come. Match Me If You Scan evolved over the course of the festival too. Originally I invited the barcode-wearing volunteers up onto the stage, but I found they clumped together in a corner. This was visually uninteresting and there was little physical movement for the Floor Manager. Keeping them seated was far more exciting to watch, and highlighted the role of the audience as physical obstacles. Players who weren't wearing barcodes would have the player constantly passing by their side, bringing the audience back into the action. I was surprised by how quickly my stage persona took form. In my head I became Richard O’Brien from The Crystal Maze after six cans of Red Bull - wide-eyed, mysterious and uncontrollably excitable. I think this reflected the personality of the games themselves! I’ve always been very confident doing conference talks, but doing a 45 minute set of game demos with audience interaction and improv is not something I’d done before. It required a lot of energy and I had to be able to think on my feet, either when the tech went wrong, or when there was an opportunity to respond to the audience. Getting people into the right spirit is a really important part of all my installations. Just like in those cases it was upon me to arouse that enthusiasm and team spirit. So from early in the show I got a spectator to give the audience a team name, another to pick the noise they had to make when it was mentioned. Each game had a little improvised intro involving back-and-forth with audience members, and I'd work in the team name to get everyone to make that noise back. Not only does it warm them up for laughter and participation, but also gives them something unique to latch on to. It emphasises that every show is different, and that the room is a team. Much of each intro would build up the game as a chance to live out some kind of ambition - even if that ambition is childish or banal. For example, recruiting volunteers by shouting “who has always wanted to be a Power Ranger?” stirs their imagination and creates context. It’s the difference between just running around with a tablet and embodying the ridiculous spandex-suited heroes of our childhoods. As host I was also commentator, reiterating what was going on in case anyone didn’t understand. Games are often learnt through participation, so the host had to fill that gap for spectators. Similarly, I had to be emotionally responsive to participants' needs. If one player seemed uncomfortable appearing silly on stage I could ease them into the spirit by being clearly more silly than them. In some cases I acted as a visual shield between them and the audience, helping them feel more at ease. One of the biggest lessons of the stage came from understanding the mentality of the audience as they go through the experience. A designer you must respect that visitors do not approach a theatre as they would games on a phone or console. They come with expectations - in particular that the show will be a largely passive experience. When first invited onto stage they feel trepidation, knowing they have agreed to participate in something that they know nothing about. Indeed, they have entered the room, but they have not entered into the magic circle. It is the role of the show and its host to coax people into the magic circle - to build up their trust and make them feel it’s okay to come onto the stage and look a bit silly. Meanwhile, you have to respect that not all of the audience want to enter the circle. Some simply want to spectate. The other thing that stood out about the theatre as a play space is how many roles were offer for participants to embody. An example of what I mean is in Go! Power Team! Four Rangers were performing in front of an audience, doing silly physical actions by order of the computer, and often trying to get a laugh from the crowd. The Hero of the Galaxy was running from place to place to press buttons, their attention directed more towards the technology than the crowd. 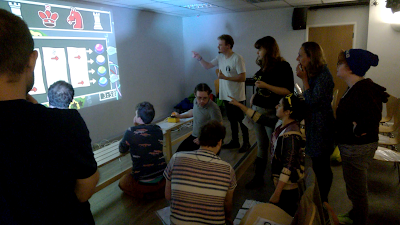 The host took no active role in the game itself, but motivated players and the audience to interact. Finally, the audience themselves had an opportunity to shout out the colours from their seats, and try to interact with the rangers. That's four wildly distinct roles, four wildly distinct motivations, all in play at the same time. Within the rich web of roles for participants are different levels of activity, of attention, and of responsibility. Players coming onto the stage choose to be subject to the gaze of the audience, where they may embarrass themselves or make others laugh. 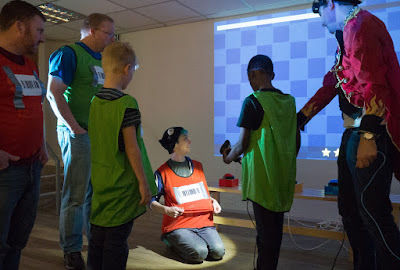 They can show themselves to be a good sport, and express their personality: taking the lead in a group, for example, or teasing the Hero by being an uncooperative Power Ranger. For some players, for the game to be meaningful they wanted to get stuck in, pressing the buttons and wearing the power belts. For others being able to interact in a fairly passive way - shouting at Sonic, for example - was enough to feel like they were part of a unique experience. Indeed, being a good sport carries a level of responsibility - the Rangers can't be too defensive lest they make the game dull, but the Hero can be as wild as they like in order to win. This is a rich tapestry of human interactions and player roles. As a designer, this excites and inspires me. It raises an opportunity for new kinds of games that experiment with participants’ roles. It's not limited to the theatre, but having so many available participants makes it possible. I am itching to take The Incredible Playable show to new venues and explore what can be done with it. The next shows will be 21st - 23rd December at the National Videogame Arcade, and I'll be looking to take it to games events at any given opportunity. It's too much fun not to after all! My plan is to take it to all kinds of new audiences, within gaming circles and beyond. 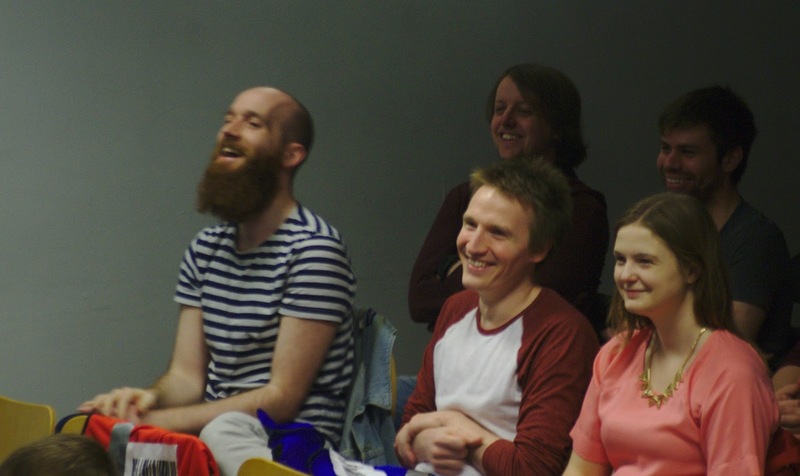 The stage has much to offer games, and there is so much for us to learn - from improv, from stand-up and from dance as well as from traditional narrative. It's hard not to be hungry for it. Every new venue, or timeslot, or audience, is an opportunity for a new version of the show. Each performance is an opportunity to better understand the space where play and performance meet. So here’s to a playful 2017!